Orlando, Florida was once a very quiet farming community that later sold its land to the Wonderful World of Disney. Disney World was one of the first major theme parks in the United States. Orlando offers Walt Disney World, Universal Orlando Resort, Sea World Orlando and Lego Land Resort. The Empire of the Penguin at Sea World is projected to open its doors in the Spring of 2013. Besides being a city of legendary theme parks, Orlando is also the city of 500 restaurants. Swaying palm trees, beautiful hotels and nightlife full of adventure express the very exquisite elements of Orlando, Florida. Select from this list the location you wish to rent your car. In particular note the times that your desired location is open to avoid your booking being rejected. 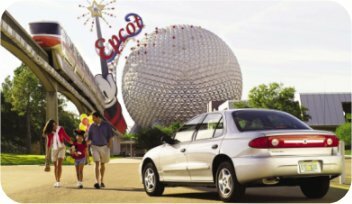 See how much a one week car hire in Orlando costs next week.